I may be one of the few people around who isn’t really fond of eating fish. I’ve tried many times with different kinds of fish, and I really struggle to enjoy it, or even want to cook it. Especially salmon. But my family likes it, and it has so many quality nutrients, that I keep on returning to try and find a recipe that works for me and my family. This one worked! 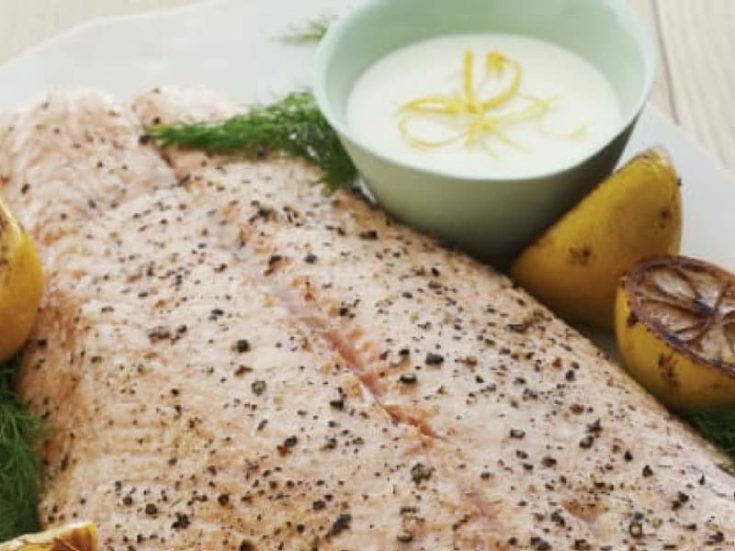 This salmon with lemon sauce recipe was delicious, and I actually enjoyed eating it myself. This time when making salmon, I made the sauce creamy, which really seemed to do the trick for me. I made the sauce the same way I make my white gravy for biscuits and gravy, except when I would normally would add sausage, I added lemon and dill instead, and it worked out deliciously. In fact, I liked the sauce so much, I doubled the recipe and used the other half over pasta, which was also fabulous! The trick to the sauce is watching the butter closely as it melts. Its also important to use real sweet cream butter. Margarine won’t work nearly as well. If you don’t add the flour at just the right time, and stir it in quickly, it can brown and clump up. Test for readiness by dropping a couple drops of water into your pan. If they sizzle a little in the pan, then you know its time for the flour. Make that paste quickly, and as soon as it is smooth add the milk slowly, stirring constantly. I also recommend having all your other ingredients completely ready, and within arms reach before you start the creamy sauce, so you’re not having to stop to grate and juice the lemon while stirring the sauce. If you get the salmon in the oven just before you start the sauce, they will probably be ready at about the same time, and you will be able to transfer the sauce directly over to your cooked salmon. You may want to serve the sauce on the side, as some people may like only a small amount and others, like me, may want a more generous portion. Preheat the oven to 425°F. Lightly spray a baking sheet with cooking spray. Place the salmon on the prepared baking sheet and sprinkle with 1 teaspoon salt. Bake until just opaque in the center, 20 to 25 minutes. While the salmon is baking, melt the butter in a medium sauté pan over medium heat. Add the flour and stir until it becomes a smooth paste. Add the milk, whisking constantly, and cook over medium heat until the sauce begin to boil and thicken. Simmer over low heat, whisking constantly, for 5 minutes. Stir in the heavy cream, lemon zest and juice, dill, and salt and pepper to taste. Remove from the heat. Transfer the salmon to a serving platter and pour the sauce over it to serve.